Conservation & Wildlife Management branch members use their shooting skills to assist in the conservation of native animals and the management or eradication of feral species. We actively assist farmers, landholders and various state and national bodies in reducing the impact of feral animals on Australia's unique fauna and flora. We operate across all parts of Western Australia and our members can often be found in remote corners of the state as well as farms closer to home undertaking this critical activity. CWM programs are a self-sufficient community service to government, landowners and land managers. We are not dependent upon government funding and are a totally volunteer organisation. We are of course fully insured through the SSAA for up to $20M. This is true environmentalism in action and requires a high degree of skill along with a desire to volunteer and be part of something bigger. Above all you need to bring with you a willingness to volunteer your time and skills, a selfless commitment to the projects we undertake and an uncompromising attitude towards safety. In return you will meet a great bunch of people and get access to properties and project areas that most shooters can only dream of! Cooperation between various stakeholders is critical and although shooting remains a key control method we've evolved into a true land management organisation. Our members perform a variety of tasks including controlling feral animals, collecting data, assisting landholders in checking fences, dams and stock, managing vegetation, assisting with native animal surveys and counts and maintaining ecological communities. To become a member of CWM you must first be a financial member of SSAA. You can then apply to join one of our clubs and pass both a written and practical assessment. Club membership fees are very modest compared to most shooting clubs which reflects the fact that CWM clubs don't usually own physical ranges. Clubs usually meet once a month for hunt coordination and training and project shoots are held year round. Many club members are also members of another SSAA club or discipline. CWM clubs do not have a minimum attendance requirement making membership for FIFO workers and frequent travellers convenient but clubs do expect members to be committed to projects and reserve the right to refuse membership to those who do not demonstrate this. The critical skills needed for CWM hunts are patience, a keen eye and marksmanship. The standards of marksmanship are high but are achievable with some practice. You'll also be asked to demonstrate correct carriage of firearms in the field along with the ability to follow instructions and act responsibly in the bush. Re qualification shoots are held regularly and each member must be re qualified at least once per year. Additional skills include basic navigation, radio communications, first aid, wildlife identification and management, field craft, hunting ethics and 4WD skills. The target species for the CWM clubs vary across the spectrum of feral and pest species and depend to some extent on the objectives of the project. Cats and Foxes are always high on the list for most shoots we undertake. Goats, pigs, camels and wild dogs also feature along with rabbits. Deer are starting to make themselves more visible in the SW though of course many view them as a resource and not a feral pest. Pest birds are a common project undertaken with the Long-Billed Corella (Cacatua Tenuirostris) a particular target due to its impact on native WA cockatoo populations such as the Carnaby's Cockatoo. When culling any native species permits are sought and obtained from DPaW and activities are often coordinated with other conservation organisations to ensure positive outcomes are achieved. Members are not permitted to hunt on properties alone and teams are always used to ensure safety and efficacy. Depending on the project we use centrefire rifles, shotguns and rimfires - in fact most of our members use a combination of all of these. For pest control of larger pest vertebrates (goats and larger) a minimum calibre of 6mm is stipulated by DPaW but for really large pests like Camels and Feral Cattle much larger calibres can be required. Apart from the firearms, clubs have a range of equipment available including private radio systems, first aid kits, dedicated shooting vehicles and navigation equipment. Members typically bring their own vehicles to shoots and the trusty ute with a spotlight and UHF CB is a pretty common sight at club meetings. 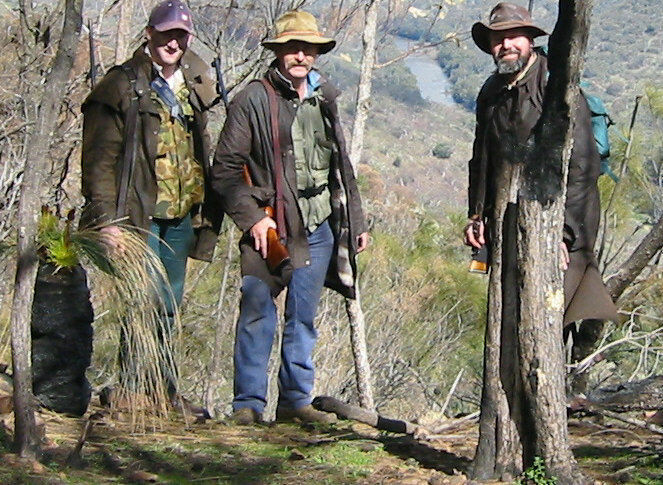 Bush wear is pretty standard - quality boots and hats along with hearing protection and fly nets are usually popular. On some projects the use of camouflage clothing can be an advantage but only where this benefits the targeting of a particular species, otherwise plain clothing is preferred for most activities. Please note: CWM clubs do not sponsor firearm applications for members - if you wish to use your firearms on a CWM project you must hold an "open" licence for that firearm and our project landowners cannot supply you support letters for this purpose. Each club maintains a register of projects and activities can be varied. Some clubs have decades long relationships with properties where members are treated almost like family and accommodation can be downright palatial (for the bush, anyway!). Other projects see members roughing it in National Parks or on Defence Land working for an agency or company in a much more formal manner. All projects have in common a great sense of camaraderie and mateship along with the satisfaction of knowing you are helping to actively contribute to conservation and to maintaining biodiversity on our land. In general we have more projects and ferals available to shoot than club members to participate so if you like shooting a lot CWM might be for you! To find a Conservation & Wildlife Management Group/ Club near you Find a Club here. Any SSAAWA club can participate in CWM activities and if you think your club can put together a team please contact our State CWM Officer here for more information.